Nestled in the forest on the flanks of Trapper Peak, this rustic timber frame home offers a peaceful retreat in the woods. Adjacent to national forest with wilderness nearby, you will find easy access to mountain lakes, hiking trails, blue ribbon fishing, big game and bird hunting, mountain biking, back packing and more. Guide services easily arranged with the help of owner/manager next door. Master and loft plus fouton in main house with full bath; large detached apartment above the shop with Queen and fouton with half bath. Coffee on the deck in the morning often means seeing the local elk herd or watching the wild turkeys pop up from the brush. Moose and an occasional black bear sometimes wander up as well. The house is rustic but very comfortable and a great place for family gatherings or to return after a day of outdoor recreation. no cell phone coverage up the West Fork. Phone for local or calling card calls only. Tv for viewing DVD's only...you are here to escape! Perfect for gathering,lounging and viewing. What an awesome cabin! We loved the cool design and craftsmanship of the home. Just sitting in the front yard, we saw a black bear and about a dozen elk. The house was clean and remote. No wifi was awesome. Great access to National Forest, all within 15 minutes. Gorgeous forest with creek nearby. Glad you liked it! I haven't seen a bear for years up there, lucky you! Hope you return one day. A cabin in the woods with a deck, a grill, two comfortable bedrooms, at the south end of the beautiful Bitterroot Valley. The only sounds are your sighs of pleasure. The cabin is at the end of a rough and long driveway, and while the host says Prius has driven it Ok I'd be cautious with a very low clearance car. Other than that caution, this has everything. So beautiful! Vacation home was so nice and clean. It had everything we needed and more. This cabin is secluded in the middle of a beautiful forest and is absolutely wonderful. The cabin is located about a quarter of a mile off the West Fork Highway. 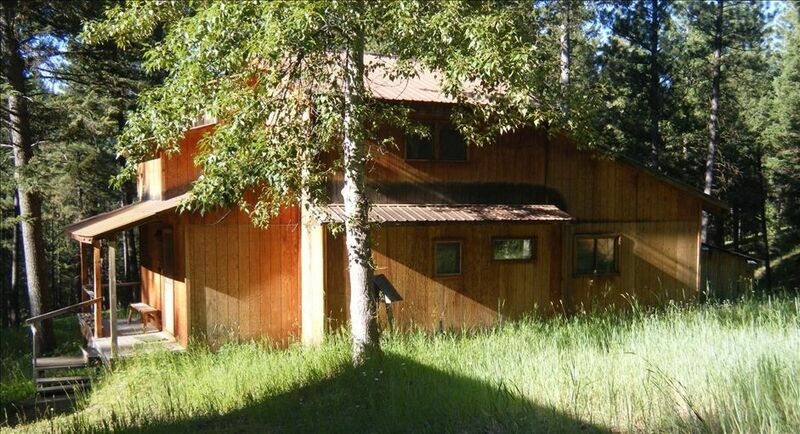 It is conveniently located to fishing access and many trailheads. There is an excellent restaurant just up the road and it is a short drive into Darby. The views from the cabin are strictly of the forest, no other cabins are visible. The cabin itself is very comfortable and equipped with everything you need (including a coffee bean grinder which really came in handy). Wildlife abounds. One of our favorite activities was having morning coffee on the back deck and watching elk (not twenty yards away), moving downhill towards the river. We have been renting Forest Service and private cabins for over twenty years and this cabin was one of the most comfortable and enjoyable that we have stayed in. We definitely plan on returning next year. We awoke our first morning to find 15 elk wandering through the property, and it got even better as the trip went on. The cabin is cozy, with tremendous privacy (apart from the wildlife) and natural beauty. We would definitely come back to this spot again. This was a great little cabin tucked back into the trees. Nicely set up with all you need to cook, sleep, etc. owners very helpful and easy to work with. Ultimate privacy setting. If I need a place there again, I'll be sure to return to this place. Just under Trapper peak, next to national forest with extensive hiking, mountain biking and FLYFISHING the Bitterroot and West Fork of Bitterroot rivers. Painted Rocks reservoir is a few miles away. One hour drive to Salmon River for rafting the day stretch. Big Hole Country and Lost Trail pass about an hour drive.